Defy Interior Acrylic Wood Finish can be used for log home interior walls, furniture, trim, paneling,doors, cabinets, and any other interior wood surface. 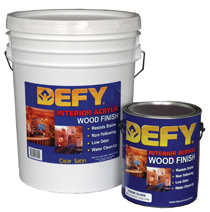 This durable, nonyellowing, acrylic-based protective log and wood finish is formulated for interior use. This fast drying, low-odor finish beautifies and protects interior wood from common household chemicals, grease, water, scuffing and abrasion. It also helps prevent fine dust penetration and makes cleaning easier. Available in a beautiful satin finish, this product's unique formula and clarity make it perfect for use over natural wood and woods stained with water-based and oil-based stains. DEFY Interior Acrylic Wood Finish can be used for log home interior walls, furniture, trim, paneling, doors, cabinets and any other interior wood surface. This protective finish makes cleaning woodwork easy and hassle-free. To clean surfaces protected with DEFY Interior Finish, simply damp wipe with soap and water, window cleaner, or a mild detergent. Surfaces should be clean and dry. If wood is new or bare, sand lightly with fine sandpaper, and remove all sanding dust. It can be applied with a sprayer or a high quality synthetic bristle brush. For best results, apply a very thin first coat in the same direction as the grain of the wood. Allow it to dry for 2 hours, lightly sand, then apply a second coat. After the final coat, the surface should be ready for light handling in about four hours.